Pit Stop USA is The Online Motorsports Superstore! For more than 30 years, Brembo Racing braking systems have helped the most successful teams in motorsports win the world's most prestigious races. Brembo offers a comprehensive range of products dedicated exclusively to motorsports and designed to deliver the best in the most extreme conditions: consistent performance, superior braking power, precision and control, and resistance to very high temperatures. All Brembo products for racing applications are the result of ongoing research and development in collaboration with the world's most prestigious teams, and of a manufacturing process conducted entirely in-house, from design and machining to bench and track testing. The Brembo Racing product range includes discs, calipers, master cylinders, pedal boxes and pads specifically engineered and manufactured to offer the ideal solution for every category of motorsport: from single seat formula racers, endurance and GT racing to NASCAR, Touring Cars, Rally and many other classes. 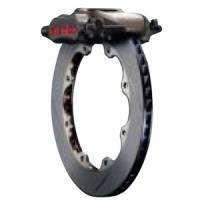 We feature Brembo racing brake components at low everyday prices.